This is a question that many of us film fans of the era ask – and have asked for years. Joan Rice was discovered and signed up by Rank then prepared and trained as an actress, getting her first film role in Blackmailed with Dirk Bogarde. 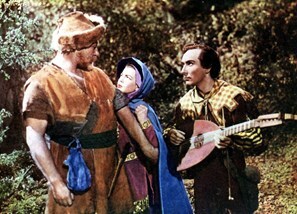 Soon afterwards none other that Walt Disney personally chose her to star in the very expensively produced ‘The Story of Robin Hood and His Merrie Men’ opposite Richard Todd in 1952 – filmed through the summer of 1951 at Denham Film Studios. That was very successful and so Warner Bros then took her all the way to Fiji to star alongside Burt Lancaster in ‘His Majesty O’Keefe’ – a very colourful adventure film also with Andre Morrell. So here we have TWO very big World targetted films which both did well and yet when she returned to England, ( and quickly got married.) the film industry lost interest in her. She tried to kick start things again by taking to stage acting and touring with repertory theatre productions but this did not get her back and she eventually packed it in and set up her own Property Letting Agency in Maidenhead – where she died in 1997. The picture of her with Joan Collins above arriving for a screen test is one I have never seen before. This is a mystery that I have tried to answer for many years. Perhaps we can just put it down being offered poor scripts and having a poor agent. 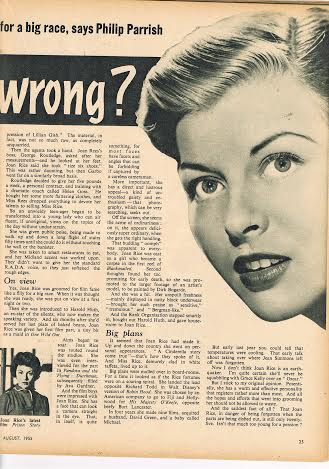 Yes we have wondered about Joan Rice and her film career for years now, and this article goes a little of the way to answering the questions we have had. Not wholly though – although I had no idea that she had been considered for Pandora and the Flying Dutchman opposite James Mason. You may well be right as regards her agent but Joan Rees seemed to put great effort into looking after her and her film career -and as you say she may have had poor scripts but my own view is that something happened soon after her return from Fiji that changed things – possibly her marriage. I do not believe that it went down to her acting because the two major films she made did well – and certainly to the Americans if you are in a film that makes money you are very likely to be offered more work. No, I think it was something outside the film world that affected her career.